Home » Blog » So, what's your excuse? I normally get very uncomfortable when I am in the presence of people who constantly give excuses as to why they cannot do certain things. I get uncomfortable because such people tend to spread negative energy wherever they go. I personally know for a fact that nothing is impossible if you put your mind to doing it. Yes, it is all in your mind. Like Henry Ford said, “there are two kinds of people in the world; those who believe they can, and those who believe they can’t. Guess what, both are right”. What this simply means is that if you believe you can do something, then regardless of the circumstances surrounding you, you will go out of your way to reach your goal because you believe in yourself. Obstacles, hindrances, setbacks and all other negatives will be there to deter you, but because you believe in you, then you will find a way to achieve what you set out to do. This theory has been proved several times over by many people in the world. For instance, just next door in Kenya there is an athlete famously known as the “Youtube Athlete”. He earned that name not because he has amassed many videos on Youtube (which he probably has), but because he taught himself this “exotic” sport through Youtube. Yes, you read right. 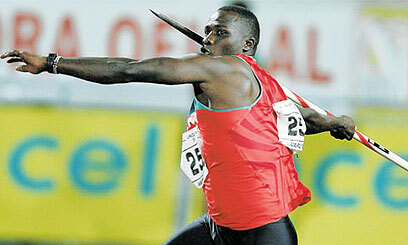 Julius Yego did not have anyone to train him how to Javelin throw, but because he loved the sport and was determined to excel, he decided to use the only means he had; watching as many videos as he possibly could of the Javelin legend, Jan Zelenzy, since he (Yego) was a small boy. Today Yego is a boy no more and he has not only made a mark in history as the “Youtube Athlete”, but he also recently earned recognition and acknowledgement in his category in the recently concluded Moscow 2013 Athletic Championship. Though he did not win the medal he had been eyeing, he is still no doubt a winner in the eyes of many considering he broke the record he had set the previous year, and only missed this year’s medal by less than a meter. Through his determination and focus, he has brought attention to himself and now trains in Finland, the land of Javelin lovers. Yego could have decided to give up on his love for Javelin considering there were no role models for him in Kenya at the time. As we all know, Kenya is the home of thousands of steeplechasers and marathoners. He could have become a long distance runner too since he comes from the region anointed with fast legs, but he opted to go a totally different route, knowing fully well there were no locally available resource persons for that direction he chose to take. However as we now know, he did not give up but opted to use a different approach to achieve his dreams. He did not see what he didn’t have, but instead chose to see what he had; the Internet and all its resources. Another example of someone who believes in impossibilities is a lady who is unbelievably strong and unique in more ways than one. I’m not sure whether you have heard of a lady called Jessica Cox. If not, just Google her and read her highly inspiring story. But just to give you a brief of who she is and why she is an inspiration, this is a Filipino-American who was born armless. She learned to live a normal life with the use of her feet. By normal life in this case I mean that she can drive, text, type on a keyboard, play the piano like anyone else, among other things. The only difference between many of us and her is that while we use our hands to do all these things, she uses her feet. What is most amazing is that her condition did not stop her from making great accomplishments in her life, some of which neither you nor I would have thought possible. For instance, she is a licensed scuba diver, a taekwondo black-belter, as well as a pilot with a Guinness World Record. Now, how is that for a challenge, especially for those of us who are fully abled to do this and more? Of course with such a record she attracts many reporters and interviewers, and so in one such occasion, she was asked what her greatest achievement was. To quote her “the achievement I am most proud of is maturing from someone who was angry and upset about being differently abled, to now being able to celebrate that and use it as an opportunity to give hope and inspiration to people”. What a humble response. As of March this year, she teamed up with Handicap International to help change the mindsets of people in Ethiopia. According to her, in Ethiopia, people with disabilities are shunned, many of them being denied education because their parents don’t think they can gain anything from going to school. What a retrogressive way of thinking. Her role, together with the team from Handicap International, was to share her life story, her accomplishments with an aim of changing people’s attitudes so that they could see that disability is not inability. She was also going to try to encourage the acceptance of persons with disabilities in that society and the world as a whole. What a noble cause! If this 30-year old armless woman can achieve what she has achieved, what is your excuse not to? I remember reading one of her quotes where she said that her accomplishments are just as much a story of opportunity, as they are about possibilities. But the truth is, if she had felt sorry and resigned herself to her condition, would she have made it to win recognition in the world, leave alone the Guinness World book of records? I bet the answer is a resounding no. I don’t know what your challenge is really, and though I stand to be corrected, I don’t believe it can be greater than Cox’s challenges. As I write this article I can’t image the amount of work she had to put in, in order to defy all her odds to become the inspiration she is today. It is mind blowing trying to imagine her flying a plane at 10,000ft above sea level, since that is what she has been licensed for. I also can’t imagine her kicking some man’s behind simply because he probably assumed she was a “person with disability”. I have to admit though that this would be interesting to watch. And as for her handwriting, I bet it is better than that of some people whose handwriting could be mistaken for being the Wingdings font in Microsoft office; you know that font that looks like gibberish? Yeah. That one. As I conclude this article I do not know what your challenges are, nor do I know what limitations you really have. What I do know is that if you make a conscious and determined decision to not let those challenges and limitations stop you from achieving your dreams, then you can rest assured you will achieve them. The road ahead may not be easy for you, but your determination will be enough to catapult you to your desired destination. For instance if it is a question of being illiterate, the now late Kimani Maruge, who joined primary school at the age of Eighty-Eight (88) is a classic example that if you are determined, nothing will be a barrier to achieving your goals. If it is a question of not knowing how to perform certain duties at your office, asking someone who knows will not qualify you to be a fool; if anything, your not asking may actually prove you to be one especially when you make a mistake that affects the company adversely, yet this could have been easily avoided had you asked for guidance. As we start this week I leave you with some few questions; what is your excuse for not doing more than you are doing today? What is your excuse for living a mediocre and unfulfilling life? What is your excuse for not living up to your full potential? As you answer those questions, think about these words by Jim Rohn, “If you really want to do something, you will find a way. If you don’t, you’ll find an excuse”. Wishing you all an excuse-free week! PS: Article published in Tanzania's Guardian on Sunday on the 22nd September, 2013, under my weekly column "Thoughts in Words"
Why struggle to fit in when you were born to stand out?